Sometimes all you want is a little bit of everything. Los Angeles based artist and curator Ben Sanders knows the feeling, so for Left Field Gallery’s 21st show (aptly titled 21), he brought in a sampling of work by 21 artists based in places from the East Coast to Tokyo to SLO. Many of the artists in the show are friends or friends of friends from Sanders’ art world, including several artists with disabilities. Media include acrylic, cartoons, watercolor, printed posters, tile sculptures, photographs, and pieces constructed from cardboard. 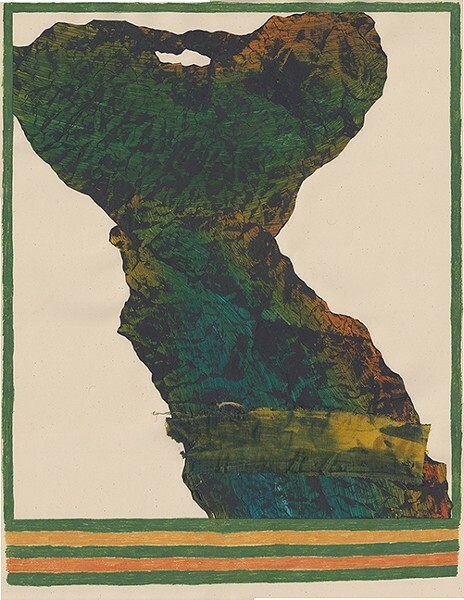 PORTRAIT OF A SCULPTURE: Chyrum Lambert, a Los Angeles based artist, crafts collages like 865 and 874, inspired by sculptural shapes that are a combination of ink, acrylic, fabric, and colored pencil. With about 35 pieces to stop and stare at, each of the 21 artists have one or, at most, two works on display, resulting in a veritable feast for the eyes. Philadelphia photographer Rachel Stern’s work is all about giving viewers lots to look at. 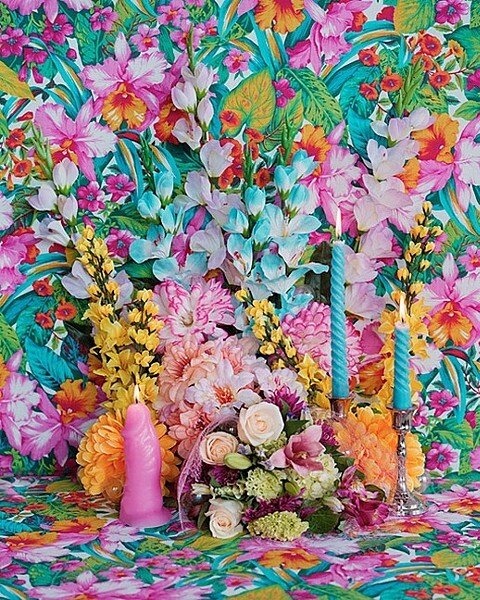 In her piece Still Life with Real and Fake Flowers featured in the 21 show, bright yellow, orange, and pink flowers and a few pink and blue candles are arranged in front of psychedelic floral wall paper. “I’m interested in accessible conversations about how aesthetics and beauty affect everyday life,” Stern said. Look just a bit closer though—wait, is that pink candle a bit, um, phallic shaped? Stern, who’s a fan of winking hard through her art, placed the candle in that piece with the idea that flowers are also symbols of female genitalia. The combination of real and fake flowers in the photo questions the difference between the two. That strategically placed candle earned Stern a moment of celebrity on Tumblr a few years back. “The joke is usually what you think it is,” she said. 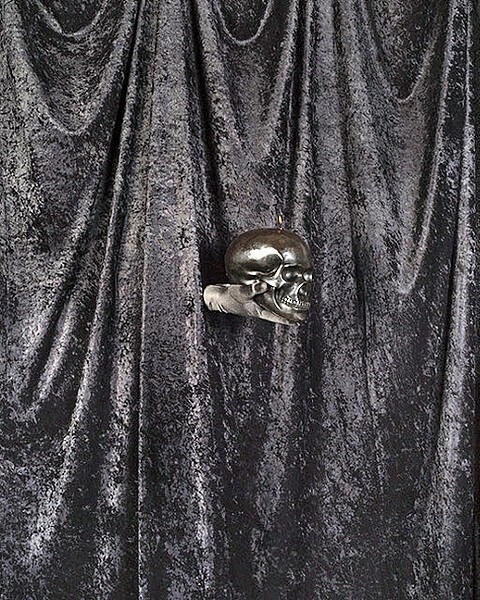 Stern’s other piece in the show, Adoration of Death, features a black skull figure sticking out from between two velvet curtains, essentially distilling a symbol for death down to its essential form. “I could dress it down and tell you a big, elaborate story, but I feel like art comes down to these basic symbols,” Stern said. Al little closer to SLO is Los Angeles artist Chyrum Lambert, who deals in multimedia art. He describes his pieces in 21, 865 and 874, as images that are suggestive of shape and sculptural forms. Often, Lambert would see a photo of a sculpture and feel let down when he saw the real thing in 3-D. His pieces are a collage of ink, acrylic, fabric, and colored pencil. SO KITCH: Philadelphia based artist Rachel Stern’s studio photographs, like Still Life with Real and Fake Flowers and Adoration of Death, focus on aesthetics and beauty in everyday life. In spite of the fact that SLO has a smaller art scene than bigger hot spots like Los Angeles and New York, Sanders said Left Field is well known as a sort of satellite for those robust creative communities. “I hope that people like what they see and that 21 shows that art is diverse and there are many types,” Lambert said. Ryah Cooley is a fan of options. Contact her at rcooley@newtimesslo.com. 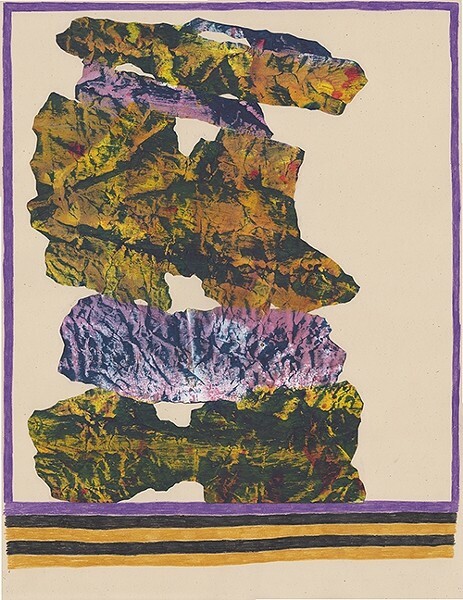 THIS AND THAT : The 21 show at Left Field Gallery in SLO runs through Feb. 26. All pieces in the show are for sale and range from $200 to $4,000. The gallery is located at 1242 Monterey St. and is open Monday through Saturday (closed on Tuesdays) from 10 a.m. to 5 p.m. and on Sundays from 11 a.m. to 5 p.m. Visit leftfieldgallery.com for more information.